Celebrate the holidays with endless ocean views and friendly hospitality. Host your family, friends or colleagues and enjoy custom menu options that blend timeless tradition with seasonal, fresh flavors that showcase the best of San Diego and beyond. 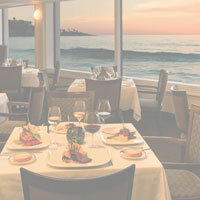 Our esteemed catering team is here to help you create an elegant dining experience for your special occasion at our oceanfront La Jolla restaurant. With customizable private dining options, The Marine Room will enhance your event with a masterful menu utilizing the artistic culinary flair of Executive Chef Bernard Guillas. From elegant three-course meals and tray-passed hors 'd oeuvres to lavish buffets for lunch or dessert, The Marine Room is more than great dining; it is an experience to be remembered.